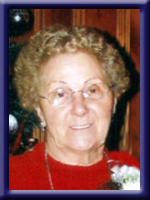 RODGER – Margaret Catherine 87, of Liverpool, passed away peacefully in Queens General Hospital on Wednesday, March 12, 2014. Born in Petty Harbor, NL. she was a daughter of the late Michael Robert and Catherine (Everett) Lee. Margaret was a former PCW with Queens General Hospital, North Queens Nursing Home, Caledonia and Queens Manor, Liverpool. She was a member of St. Gregory’s Catholic Church and St. Gregory’s Altar Society. She was an honorary member of the Ladies Auxiliary of the Mersey Branch #38, Royal Canadian Legion, Liverpool and a charter member of the Lioness Club of Liverpool. She enjoyed having people around and loved to sew and bowl. She is survived by her daughter Bernadette (Mervin) Hartlen of Milton, her sons Kevin (Tina) Whynott of Brooklyn, Lee (Jane Ann) Whynot of Liverpool. Stepdaughter Heather (Terry) Scotland of East Preston, stepsons Graham Rodger of Edmonton, Robert Rodger of Dartmouth. 18 grandchildren and 14 great-grandchildren. She was predeceased by her first husband George Robinson “Bob” Whynott, her second husband Scotty Rodger, her sisters Irene Knight and Veronica Lee, her brothers Ralph, Gus, Luke and Dennis, a number of brothers and sisters in infancy, her daughter-in-law Lynn Whynott. Visitation will be Wednesday, March 19, 2014 from 7 until 9 p.m. in Chandlers’ Funeral Chapel, Liverpool. Funeral Mass will be held Thursday, March 20, 2014 at 11:00 a.m. from St. Gregory’s Catholic Church, Liverpool. Father Keith Billard officiating. Burial will be in St. Gregory’s Catholic Cemetery, College Street, Liverpool. Family flowers only, donations may be made to theAlzheimers Society of Nova Scotia. Online condolences may be made to www.chandlersfuneral.com. Sending my condolences on the passing of your mother/grandmother. Bernadette,Kevin ,Lee and Famalies:Sorry to hear of your moms passing.Please except our sincere condolence. So very sorry for your loss, please except our most sincere condolences. To the family: We were sorry to hear about Margaret. She was a very nice person. Our thoughts and our prayers are with your family. very sorry to hear about your loss…Tony said she was the best landlord that he ever had…we will miss her. Leon and I are so sorry to learn of your loss of your Mother. Our sympathy to your families. It is sad no matter the age or their health. She is in a better place and keep your memories close. our condolences to members of Margarets family. She was such a joy to work with at Queens Manor.. I have no doubt that she was welcomed heartily through Heavens gate! Sorry to hear about your Mom our thoughts and prayers are with you all. I was sorry to hear about your mom and our thoughts and prayers are with you all. She was a very nice person. We Were Sorry to Hear Of Margaret’s Passing, What A Lovely Lady She Was. May God be with You At this most Difficult time in your Lives. Always Remember The Special times you had With Your Mom And Grandmother as I’m sure there were many. May Your Mom Now rest in Peace And Prayers are Being Sent your Way!!!! Sorry to read about the passing of you Mom and Grandmother. May She Rest In Peace. Take Care. We are sorry to hear of the passing of your dear Mother and Grandmother. Our thoughts are with you as you take comfort in each other and your memories of Margaret. I am so, so saddened to hear of my Godmother Margaret’s passing. She was such a sweet lady. Although I didn’t see her much apart from church, she ALWAYS made time to talk to me and check in on my life on Sundays. She will be sadly missed. May you hold your memories close to your heart to help you through this time of sorrow. Please accept our sincerest condolences on behalf of my family and Mom. You are in our thoughts and prayers. Margaret will be missed. Our heartfelt sympathy to all the family. I worked with and became friends with Margaret when she worked at Queens Manor. We teased her something awful as we watched her and Scotie fall in love and marry. She was funny, caring and sometimes stubborn but a good person. Please accept my sympathy in your loss. Our condolences to your family on your loss. Our thoughts are with you at this difficult time. I’ve known your mom for many years- she was one of the first people I met when I moved to Liverpool. She was always ready to stop and have a chat. Take comfort in her memories. Sending my sympathies in your time of loss. Sorry to hear of Margaret’s passing. She sure was a lovely woman, just know you have lots of memories! Take comfort in knowing that your dear Margaret has proudly and efficiently finished her earthly duties. She is now enjoying her heavenly reward. Please accept our sincere and heartfelt condolences. Our sympathy to you and your family at this time of loss. Mothers are very precious. To my wonderful stepmom who made the last 30 years of my Dad,s life amazing . We love you very much and will miss your sweet smile. Our thoughts and prayers are with Kevin, Bernadette and Lee for the loss of there mother. We will keep you in our thoughts along with your families as you grieve your loss. Love Heather Terry, Jillian and Keith Kashton , Stephanie and Craig. Please except my deepest sympathy on the death of your mom. She was truly a great lady and will be missed by all those lives she touched. So sorry to hear about the passing of your Mom. Please accept our sincere condolences. Thoughts and prayers are with you all at this most difficult time. Mom and I were very sorry to hear of Margaret’s passing. She was a fine person and will be sadly missed by everyone who knew her. May you take comfort in the knowledge that her suffering is over and that she is in a much better place. Our sincere condolances to Margaret’s family. Margaret was a lovely lady and will be fondly remembered by all who knew her. Heaven needed another Angel.Always loved Margaret’s smile.Thinking of the family.Keep the memories close.She is smiling now. So sorry to hear of the passing of Margaret. I am sure your fond memories will help you all move forward. She was always a gracious lady. so sorry to hear of the passing of Margaret iam sure your a lot of memories she was a lovely lady to work for mowing her lawn i gust heaven need another angel and remebered by all who knew her she will be our hearts forever . We were so sorry to hear about Margarets passing! She was a wonderful lady. I have many fond memories of her when I was growing up in the prefabs and when she was married to Scottie. Take care and God bless! Kevin, Bernadette, Lee and families. She was a dear, lovely lady. I am so sorry to hear of Margaret’s passing. She was a wonderful person to all who knew her and will be missed by many. For Margaret, her suffering is over and is now safe in the arms of Jesus, in eternal peace. Cherish your wonderful memories and keep them close in your hearts. May knowing she is at peace ease your hearts. My thoughts and prayers are with all of you. To all Margaret’s family,we were sorry to hear of Margaret’s passing and our thoughts and prayers are with you. She was a wonderful lady!! Our thoughts are with you all. Margaret was such a lovely lady and she will be missed. Kevin, Bernadette ,Lee and families, We were very sorry to hear about your loss and would like to express our sincere condolences to all of you . It is with great sadness that we have heard of the passing of your mother. From all of us we offer our heart felt condolences for your loss. Heaven has a place for everyone but for some there is a special place and we are sure that is where your mother is . Joyce , Laurie ,Cheryl and a special remembrance from Kevin. My sincere condolences on the loss of your mother. My prayers are with you at this time. She was a beautiful, wonderful and special lady. I am very privilege to have known her and was happy to have her in our auxiliary as a great worker. Remember the wonder memories you have of her and keep them close to you. Condolences on the passing of your Mom, she was a very lovely lady. I always remember how friendly she was, she always took the time to stop and chat a bit when you passed her on the street. Our deepest sympathy to you on the loss of your Mom. She was a great lady and will be missed to all who knew her. Our thoughts and prayers are with you at this sad time. lovely lady and will be missed for sure. Hold on to the good memories you have, they will help you during this difficult time. Kevin and Tina sorry to hear of the passing of your loved one. Know I am thinking of you both at the time, keep the good memories and speak them out load so all will know of the good qualities she did poccess. Hugs to both share with others, bless all. For the family of Margaret Rodger. at this time. Dee Veinot. Please accept my sincere condolences on the passing of Margaret. She was a lovely person. You are in my thoughts and prayers. Dear Bernadette, Kevin and Lee, I want to express my sympathies on the death of your mother. She was a kind, friendly and faith-filled woman. I very much appreciated her and Scottie’s hospitality while I was in Liverpool. Know that you and your families are in my prayers. Unfortunately I wii not be able to come to the funeral because I am on vacation in Florida. Yours truly, Fr. Brian Murphy. Our sincere condolences to Margaret;s family for your loss. You are in our thoughts. Our deepest sympathy to the family; Margaret was a lovely person. She will be sadly missed. Our thoughts and prayers are with you at this very difficult time. Our thoughts and prayers are extended to you and yours in the passing of your wonderful Mom. Margaret was well thought of in the community. God Bless. Our thoughts and prayers are with you at this time. God Bless. Please accept our sincere condolences at this time. Our thoughts and prayers are with you. God Bless. We were sorry to hear when Margaret passed, her memory will live strong in your hearts forever.. The pictures tell it all, she was a loving woman to her children, their children and their children again. Her eyes always held a sparkle of fun, she really enjoyed life, family and friends. Bless her sweet heart. I’ve known your Mom many years, worked with her at Queens Manor. She was truly a great lady. Please accept our sincere condolences. My thoughts and prayers go to all of you at this most difficult time. Please know that all of you are in my thoughts and prayers as you say: “Goodbye for Now” Your love and memories will see you through this. God bless! Margaret will be greatly missed. I have never met a sweeter person in all my life. She always had a smile and kind words for others and the world was a better place with her in it. My condolences to Kevin, Tina and the rest of her family. I was so sorry to hear of your loss. I have many fond memories of your Mom especially when I boarded with her in 1980. Margaret will be sadly missed but fondly remembered by all that knew her. Sorry to hear of Margaret’s passing. She was a lovely person and will be missed. Thinking of you all. So sorry to hear of Margaret’s passing. She was a wonderful lady who will fondly be remembered by all who knew her. Our thoughts and prayers are with you during this difficult time. Soo sorry for your loss, your nan was a spunky lady. She was very kind and friendly and fun to be around. I enjoyed the times I was in her company.